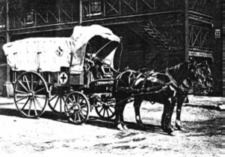 I am including copies of my collection of historic ambulance photos here for your enjoyment. Some of these are mine, while others were sent to me for display on this site. If you have any photographs of early ambulances, or even as recent as the 1990s, that I could use here, please send a digital image along with a brief description, if available. Contemporary photos are also welcome. Thanks.